Software Defined Radio (SDR) provides many opportunities for both experimentation and solving real-world problems. It is not exactly a new technology but it has become significantly more accessible due to the increases in desktop computing power (for performing the DSP functions) and simultaneous reduction in the cost of SDR hardware. 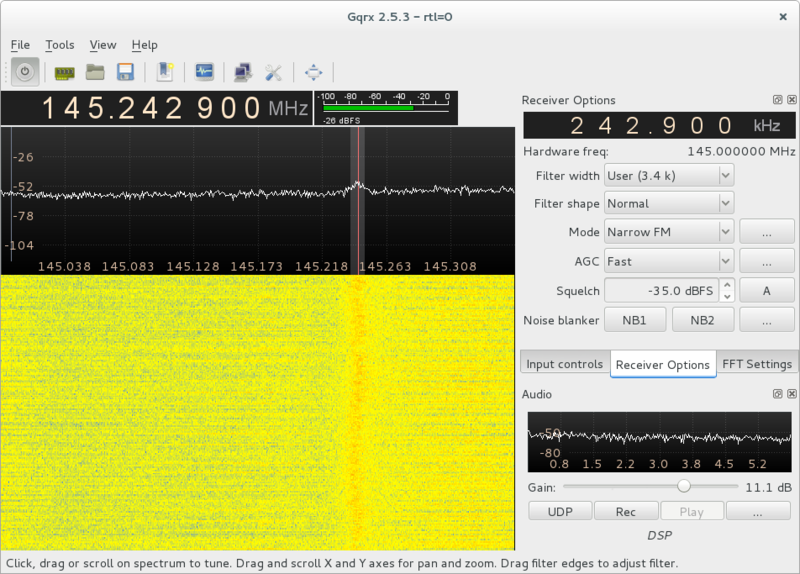 Thanks to the availability of a completely packaged gqrx and GNU Radio solution, you can now get up and running in less than half an hour and spending less than fifty dollars/pounds/euros. We provided a full demo of the Debian Hams gqrx solution at Mini DebConf Vienna (video) and hope to provide a similar demo at MiniDebConf Cambridge on the coming weekend of 12-13 November. gqrx is also available for Fedora users. There are many different types of hardware, ranging from the low-cost RTL-SDR USB dongles to full duplex multi-transceiver systems. 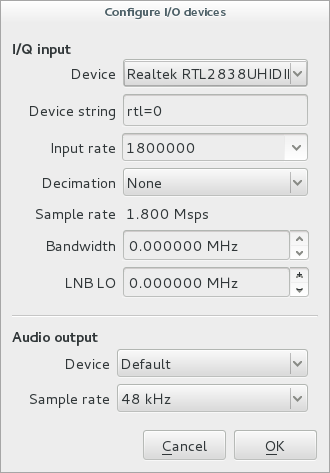 My recommendation is to start with an RTL-SDR dongle due to extremely low cost, this will give you an opportunity to reflect on the opportunities of this technology before putting money into one of the transceivers and their accessories. 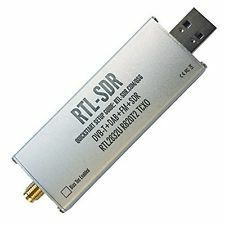 The RTL-SDR dongle also benefits from being a small self-contained solution that you can carry around and experiment with or demo just about anywhere. Important: Don't buy the cheapest generic RTL TV/radio receivers. It is absolutely essential to buy one of the units that has been explicitly promoted for SDR. These typically have a temperature compensated crystal oscillator (TCXO) which is absolutely essential for the reception of narrowband voice and digital signals. Without this, it is only possible to receive wideband broadcash FM radio and TV channels. For those who want to try it out with us at MiniDebConf Cambridge, Technofix has UK stock (online ordering), they are about £26. Note: to avoid the wrong kernel module being loaded automatically, it is recoemmended that you don't connect the RTL-SDR dongle before you install the packages. If you did already connect it, you may need to reboot or rmmod dvb_usb_rtl28xxu. If you are using a Debian jessie system, you can get all the necessary packages from jessie-backports. If the GUI fails to appear, look carefully at the error messages. It may be that the wrong kernel module has been loaded. Now the main screen will appear. Choose the wideband FM mode "WFM (mono)" and change the frequency to a value in the FM broadcast band such as 100MHz. Click the "Power on" button in the top left corner, just under the "File" menu, to start reception. Click in the middle of a strong signal to tune to that station. If you don't hear anything, check the squelch setting (it should be more negative than the signal strength value) and increase the Gain control at the bottom right hand side of the window. A popular band for hams is between 144 - 148 MHz (in some countries only a subset of this band is used). This is referred to as the two-meter band, as that is the wavelength at this frequency. Hams often use the narrowband FM mode in this band, especially with repeater stations. Change the "Mode" setting from "WFM" to "Narrow FM" and change the frequency to a value in the middle of the band. Look for signals in the radio spectrum and click on them to hear them. If you are not sure which part of the band to look in, search for the two-meter band plan for your country/region and look for the repeater output frequencies in the band plan. To start receiving HF and shortwave signals from around the world, you will need an up-converter, ATU and a larger antenna: see my next blog in the series for details of how to easily obtain the extra parts and build the antenna.